GENERATE WEB TRAFFIC and Conversions with Pay-Per-Click Advertising. Get in front of the people who are searching for you! 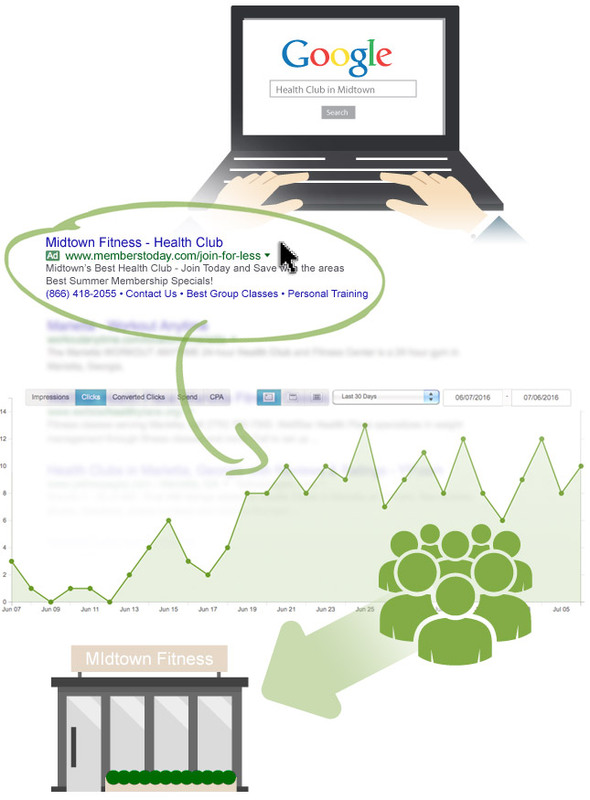 Pay Per Click (PPC) Advertising will put your health club’s website front and center and drive customer clicks. Custom created ad campaigns will capitalize on the key words that searchers are using to find gyms in your market and entice them to click through and visit your website. Advanced demographic filters enable us to focus your ads on important aspects of your client base such as proximity and device preference. One of the powers of PPC Advertising is its ability to give you immediate search engine visibility. If you are a new gym, or have a new website, or you are looking to get the jump on local competition, with PPC you will see an instant impact. Members Today PPC campaigns will send highly targeted traffic to your website in the form of qualified clicks. With the use of carefully crafted landing pages, you can convert these clicks and turn them into new members. We will find out what key words searchers are using to find health clubs in your area. From there, we analyze the search terms and determine a key word strategy that will fit your budget and bring the greatest ROI. We are experts at creating text ads that will drive clicks to your website. By using terms that drive action and are relevant to the searcher, your PPC ad will stand out among the other Google search results. Through the use of extensions, we can custom tailor your ad to include additional information about your gym that may be important to new clients. One of the greatest strengths of PPC adverting is the ability to control your budget. We will help you set a daily budget, as well as an individual key word budget that works for you and creates the highest ROI. Additionally, we can set filters to dictate who sees your ads by targeting a radius around your club and also excluding certain areas. Members Today will set up advanced conversion tracking filters to register exactly how many people are clicking on your ads and actually contacting your health club. These powerful conversion tools include tracking user submitted contact forms, as well as creating call tracking numbers that are unique to each individual click that you receive to your site from a PPC ad. At the end of every month, Members Today will provide your health club with a detailed report outlining the success of your campaign. Report data includes: conversion rate, cost per acquisition, leads, account trends, activity, top performing key words, and top performing ads. Though they are filled with important data, our reports are in a very easy to read format and filled with very clear info graphics and metrics. We Have a PPC Advertising Program to Fit Your Budget!